Wearable items include jewelry and other handcrafted items made to be worn as adornments. These handcrafted works of art are one-of-a-kind gems that are made to be proudly worn as jewelry or adornments. 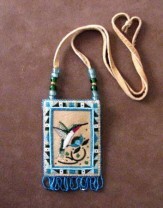 Their unique artistry is immediately recognized and sets them apart from ordinary mass-produced items.